Before calling our Consumer Care team, please review our troubleshooting options. You may be able to correct a problem with your Silhouette appliance by following these recommendations. If my unit is NOT flush-fit integrated, how should this unit be installed so that I can open the door 90 degrees? 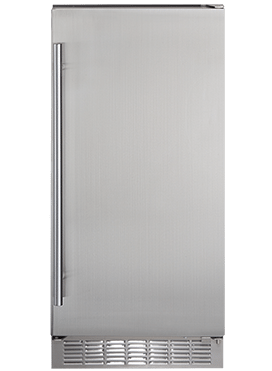 The door of your Silhouette appliance would need to sit forward within the cabinet opening so that the front cabinet of the cooler is flush with the surrounding cabinetry. The door of the cooler will protrude farther than the cabinet front. 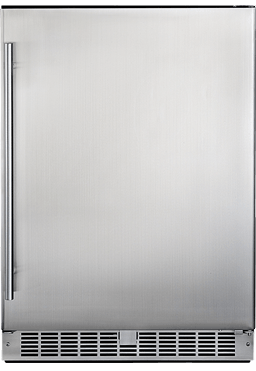 If you were to attempt to push the cooler back so that the door was flush with the surrounding cabinetry, the door may hit the surrounding cabinet when opened and potentially cause damage to the appliance. Why is it NOT recommended to use Silhouette products outdoors (excluding outdoor-rated products)? Your wine cellar or beverage centre is designed to operate at room temperature 68°F to 79°F (20°C to 26°C). All residential appliances have areas where electrical connections are not protected from moisture. If water / moisture can get into these unprotected areas then there is a risk of creating electrical shortages which may cause premature component failure. Using your Silhouette appliance outdoors will void your warranty. Can I operate my Silhouette product in my garage? Silhouette products are designed to operate in your home at room temperature 68°F to 79°F (20°C to 26°C). All residential appliances have areas where electrical connections are not protected from moisture. If water / moisture can get into these unprotected areas then there is a risk of creating electrical shortages which may cause premature component failure. Using your Silhouette appliance in the garage will void your warranty. Is there a power switch that controls complete power to the unit (rather than having to physically unplug)? There is a power button located on the control panel. Press and hold for 3 seconds to turn the units off or on. I just got my Silhouette product home; can I plug it in right away? No, we recommend that the unit stands for a minimum two hours before plugging it in. There are fluids in the compressor that may have moved up into the sealed system during transportation. Letting the unit stand allows the fluid to settle back to its original place. Plugging it in immediately could result in damage to the unit and void the warranty. Why does the temperature control fluctuate within 3-5 degrees from desired temperature setting to actual? 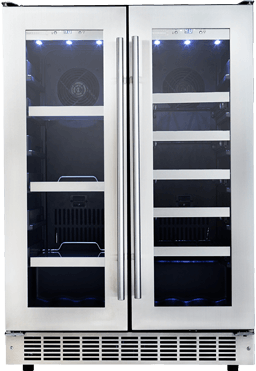 The temperature range will fluctuate depending on how often the door is opened and the amount of room temperature items placed in the cooler at one time. When using your Silhouette product for the first time or again after it has been unplugged, it will take approximately 2 hours for it to reach the set temperature. Why is there a slight variance in temperature between the top and bottom of my Silhouette product? The internal fan system does its best to circulate the air inside the cabinet. However, hot air rises and cool air falls, thus there will be a slight variance in temperature between the upper and lower chambers. What is the best/suggested temperature range to store red and white wines? What is the temperature range of my wine cellar? 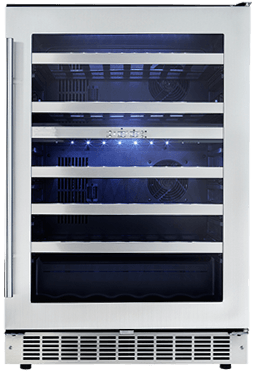 The temperature range of your Silhouette wine cellar is 39°F and 64°F (4°C to 18°C). Please note that the temperature may fluctuate +/- 2°F. It sounds like my fan is continually running. Why? There are two types of fans in your Silhouette product, the condenser fan and the evaporator fan. The condenser fan will run when the compressor is running and the evaporator fan will run in 10 - 20 second intervals then shut off for the same amount of time. This cycle is continuous as long as the unit is powered on for cooling. Our tests show that this creates the best, most consistent temperatures in the cooling compartment. How much ice (lbs.) does the ice maker in the 3-in-1 Entertaining Centre generate in a 24 hour period (if continuously used)? The 3-in-1 Entertaining Centre is able to produce 8lbs of ice in a 24 hour period and can store up to 4lbs. Will the ice maker in the 3-in-1 Entertaining Centre keep the ice frozen? Yes, the freezer in the 3-in-1 Entertaining Centre is designed to both make and store ice with a temperature minimum of -2°C. How does the Undercounter Ice Maker drain? There are three drainage options for the ice maker. (1) Manual drain: The excess water gathers in the water reservoir and the user removes the reservoir to empty it. This method is only recommended for remote areas where other drainage options are not possible. There is a risk of overflow if the reservoir is not monitored or if the unit is left on for an extended period. (2) Gravity Drain: The drain hose is attached to the reservoir and fed into a floor drain (see product owner’s manual for instructions). (3) Pump Drain (pump included with unit): The drain hose is attached to the reservoir and the water is pumped to a drain located above the unit (i.e. sink) or a floor drain at a farther distance. Why does the ice melt in my Undercounter Ice Maker after a period of time? The ice maker is not a freezer. If you would like to store the ice as it is made, you will need to remove it from the ice maker and store it in a freezer. How much ice does my Undercounter Ice Maker produce in a 24 hour period? The Undercounter Ice Maker produces up to 32 lbs of crystal-clear ice cubes daily. On my Undercounter Ice Maker, do the icons with the illustration of cubes mean the amount of ice that will fill the bucket? No, the icons on the control panel indicate the cube volume. There are three cube volume options, small, medium and large. The physical cube size is always the same, however the more dense cubes (large) take longer to melt. How is the Undercounter Ice Maker cleaned? This unit can be cleaned using an ice maker cleaner available at most hardware stores. See the video for directions. Can a drain hose be connected to the bucket on my Undercounter Ice Maker? Yes, a drain house can be attached to the reservoir for draining in a floor drain or sink. See the drainage options in the owner’s manual. I have a dual zone wine cellar, and I drink more red wine than white wine. Can I switch the zones so I can store my white wine on top and my red wine on bottom? The top zone is designed to store red wine however, you may choose to store white wine there instead. As the air cycles through the unit, warmer air is pushed toward the top compartment. As a result, your red wines may be cooler than you prefer and your whites warmer should you decide to switch zones. I just purchased a Silhouette product and it is making gurgling/bubbling sounds. Should I be concerned? It is normal for your Silhouette product to make gurgling/bubbling noises. These sounds are a result of the refrigerant traveling through the lines in the product. This noise is different in every product and may be amplified if the unit is in an enclosed space or on a wood floor. Why does the unit beep? The unit will beep if the door has been left open or ajar.